There is a common problem where it is difficult to determine what your CPU can really do. Given the widespread addition of features in the last few years, it is often a mystery what your system can really accomplish. One area of huge importance is whether or not the Intel CPU can support VT (Virtualization Technology). Many programs (like XenServer) depend on this new feature to be able to virtualize Windows. 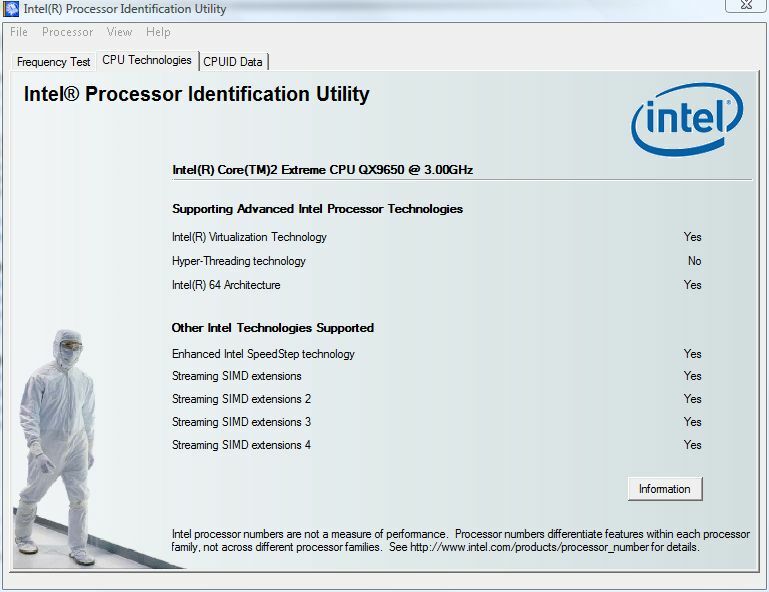 Today brought the discovery that Intel provides a program called “Processor Identification Utility” on their web site for download. As part of this program it identifies the processor as well as features like VT. Given that they created the cores and are updating the PIU (Processor Identification Utility) to match, it should be a good place to start. After having downloaded and installed the program (which seemed a bit complex for a query program), the execution was easy. From here the main features are identified. To show my ignorance, I had no idea that my work system was a quad (thought it was a dual). It also showed that VT was there. Now, this presents a problem. Either my copy of VirtualPC 2007 is wrong (which tried to use VT) or the BIOS had it disabled. Most likely VT has been disabled on the board by the configuration. Regardless, the tool is useful enough to recommend using for determining Intel processor features. CPU-Z is also pretty nifty at telling you about your system and works with AMD chipsets as well. Used it many times to find out how much and what kind of memory is in a system prior to upgrade. CPU-Z is a very useful alternative. Like you said, it supports AMD and also is a bit more generic when it comes to things besides the processor. It is free to download from the web site http://www.cpuid.com/cpuz.php . It appears it is also possible to get a SDK to build your own version of it.